Official CyanogenMod 13 OnePlus 2 ROM is now available. This is the official Build of CM 13 for the OnePlus 2 and based on the Android 6.0.1 Marshmallow. 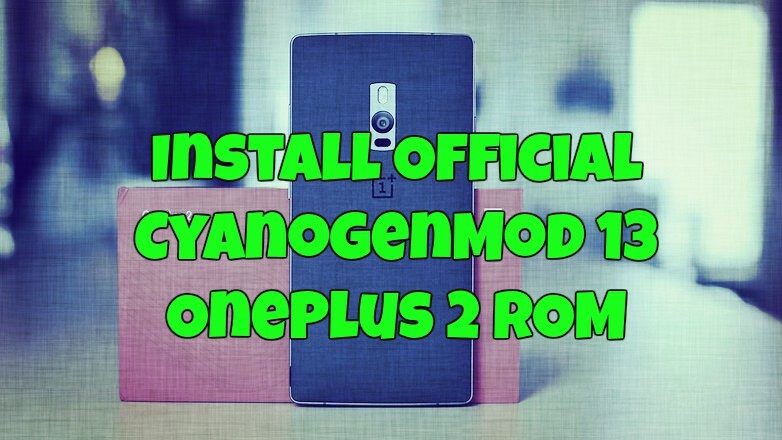 Most of the Oneplus 2 users are waiting to this and want to install the Official CyanogenMod 13 OnePlus 2 ROM. The new CM 13 ROM comes with lots of features, Focused On Performance, Battery, And Stability. If you are the Oneplus 2 user and want to download and install CM 13 Rom on your phone. Here is the detailed guide which you can follow on your smartphone and update the same with the new Official CyanogenMod 13 ROM. All you need a Rooted Oneplus 2 with the Custom Recovery to flash this new Android 6.0.1 Marshmallow ROM. Read All the steps very carefully and follow all the steps one by one on your Oneplus 2Phonew to flash the CM 13 ROM. a) OnePlus 2 Unlocked Bootloader with Custom Recovery. b) Nandroid Backup (Optional) If something goes wrong at the time on flashing, you can quickly restore your system with this method. Step 1. Visit this CyanogenMod 13 page and download the latest cm-13.0-XXXXX-NIGHTLY-oneplus2.zip file on your desktop and don;t unzip the file. Step 2. Now Download the Google Apps package for CM 13 ROM from here and save on your desktop. Step 3. Move both the Files on your Oneplus 2 Android smartphone internal memory and remember the location of the files. Step 4. Now boot your phone Recovery Mode. Turn Off Your Phone And Enter Recovery Mode By “Volume Down + Power Key” At The Same Time. Step 5. Once your phone is in custom recovery mode. Go To ‘Wipe And Format Option ? Wipe Data, System, Cache And Dalvik Cache’ Via Custom Recovery. Don’t wipe the Internal Memory. Otherwise, you will delete the ZIP file that you saved on your phone. Step 6. Now go back to the main menu and SLect the Install option and Navigate To The “cm-13.0-XXXXX-NIGHTLY-oneplus2.zip” File That You Downloaded in Step 1 and flashed it. Step 7. After that Flash the Gapps zip file that you downloaded in Step 2. Step 8. Now come back to the main menu of custom recovery and Reboot Your Device And Enjoy CyanogenMod 13 And Marshmallow On OnePlus 2.